If you are interested in getting the most returns for your lifting efforts, pay attention to this next sentence. The ability to develop maximum physical strength and development rests solidly in your legs. To neglect them, even slightly, is to hold back your progress. 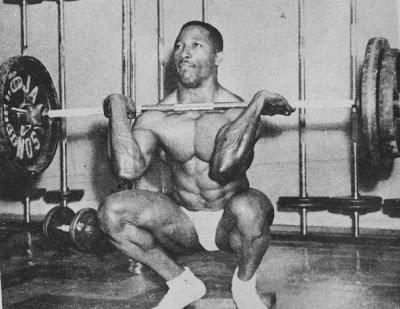 John Davis, noted for his heavy squats, created some of his greatest records at a time when he was regularly squatting with around 600 lbs. 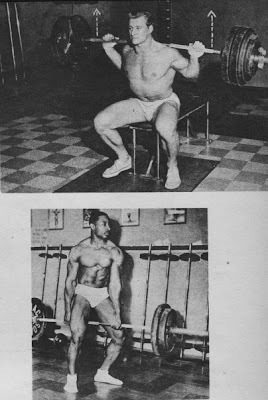 Doug Hepburn hit his peak in the bench press, created a world mark in the standing press and smashed half a dozen other records after he had worked his squat up to 700 lbs. Paul Anderson hit his weightlifting stride after he was regularly reported to be squatting with weights between 750 and 800 lbs. In fact, Anderson could be almost be called a complete product of the squat. If the reports concerning his training are correct, the first several years of his training were dedicated almost exclusively to squats. Not only did he develop such sensational power from them that today there are many who believe he is the strongest man in the world, but he also built himself up to weighing in the neighborhood of 300 lbs. In the past, many bodybuilders have found their progress slowing to a standstill, with results coming at a near negligible rate. Then, after concentrating on leg work, they snapped out of this temporary slump. 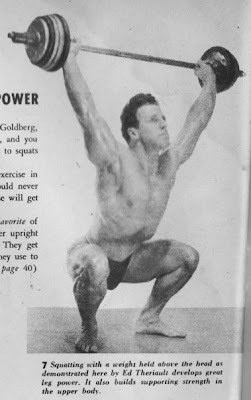 Classic examples of this include John Grimek, Reg Park, Abe Goldberg and many others. While not all lifters may desire the bulk of Anderson or Hepburn, the majority are interested at times in gaining weight, and they can learn a valuable lesson from the above. If concentrated leg work helped Anderson and Hepburn to gain 100 or more pounds of bodyweight, it is sensible to presume that similar concentrated work on the part of the average lifter will result in a gain of 10, 15, or 20 lbs. The beauty of leg training is that you can go just as far as you want in it, and then. with a minimum of effort, retain all that you have gained. You can use leg work for almost any bodybuilding goal. To gain weight, the repetitions are to be low, from 5 to 8 a set, working up to 5 sets of each exercise. Selecting two of the listed leg exercises and concentrating on them for a month or so, making an effort to handle limit poundages, can result in a remarkable gain. For endurance perform sets of 15-20 repetitions, very strict and concentrated. To develop power try this – warm up with about ½ of your maximum weight and perform 3 or 4 easy repetitions. Take a short rest and add 15-20 lbs., doing 2 or 3 reps. Take another short rest, add some more weight and perform another 2 reps. You should now be warmed up. Take a slightly longer rest and then add more weight and perform a single repetition. The weight increments can be altered after determining how many total sets of singles you plan on performing. Continue doing this, adding weight until you fail to make a single repetition. Then, take a good ten-minute rest try that same weight once more. Whether you make it or not, drop down 30-50 lbs. and perform as many reps as you can with this lighter weight. Only attempt a workout of this nature when you feel full of pep. On less energetic days, stop short of your limit for one repetition and perform 5-10 sets of one single rep each. And – leg work need never be boring. There are many variations of squats, some of which I shall list in this article. My suggested plan is to select two of them and work hard on these two for a month. Then, pick another two variations and work them for a month, and so on. Regardless of which variations you choose each month, work on them hard if you want real results. Now, to take a look at a few of the various types of heavy leg exercises shown in the accompanying photos. 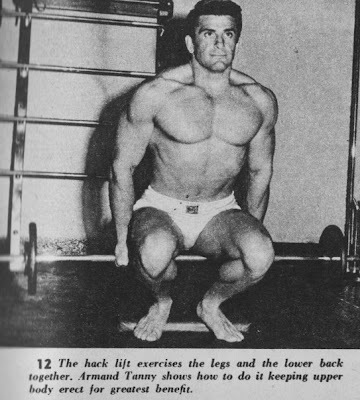 Regular Flat Footed Squat – note how deep Clarence Ross sinks and how he maintains an erect back. This depth of squat gives real stimulation and the flat back focuses more of the work on the hips and thighs. Deep Knee Bend on Toes – It is harder to maintain the balance in the variation and less weight must be used. Squat with Heels Raised – A shoe with built-up heel can be used, or the heels of the feet can be placed on a board. Some lifters believe that this style is the easiest. Only experience will tell if this holds true for you. Note the angle that the knees are turned out in the illustration. Marvin Eder demonstrates the Close Stance Squat. This is tougher than the knees pointed out position and places great stress on the frontal thighs. The Wide Stance Squat strongly affect the thigh biceps and can be used to add stability to your regular squatting. Forced Rep and Lowering Only Squats – In this variation a very heavy weight is used and two training partners assist in the raising of the weight when the lifter reaches the sticking point. Squatting with heavy weights such as can be used with this version give you a better feel for lifting greater poundages and can build up exceptional power. Overhead Squat – Tremendous muscular coordination, balance and support strength are developed with this version of the squat, though less weight must be used, especially when first learning the movement. Front Squat – This type of squat, besides building up the legs and front thighs in particular, is especially valuable for Olympic lifters. Bench Squat – In this exercise, the lifter sits down as shown and then arises to a standing position. Various heights of high or low benches or boxes can be used and tremendous weights can be handled once you become used to the movement. 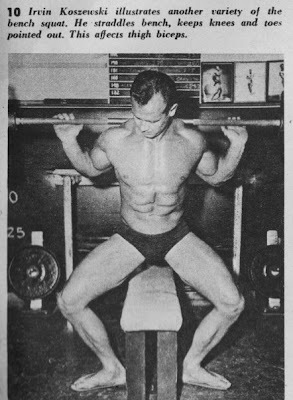 Irvin Koszewski demonstrates a wide-stance bench squat, straddling it with both the toes and knees pointed well out. Different combinations of squat variations and stance alterations can add variety to your workouts, however, care must be taken to adjust to each version before adding weight. The Straddle Lift is a real power and bulk builder. The only objection to it is that the grip of some lifters is too weak to be able to match the strength needed to work their legs. This can and should be corrected, or the use of straps can aid in holding the weight. The use of a harness which fits over your shoulders and can be attached to the barbell will also solve the problem and permit you to use maximum poundages. The Hack Lift is performed by standing erect holding the weight behind the body as shown in the illustration. A simple to construct apparatus can also be used to hold the bar in this movement. There are, of course, many other types of leg exercises possible. I haven’t included any of the iron boot movements, those with a leg curl/leg extension machine, one legged squats, jumping squats, step-ups, etc. These exercises are all valuable, but for the most part they are not on the same level as the listed bulk and power producers I have described. That’s really about all there is to it. Now go to work.